Shadows on the Wall: Critical Week: Bafta with beards! On ice! Critical Week: Bafta with beards! On ice! The British Academy Film Awards - better known as the Baftas - were held last night at the Royal Opera House in Covent Garden, a gorgeously glamorous venue even on a grisly night in which the driving rain turned to sleet and then snow. A-listers bravely made their way up the icy red carpet under umbrellas and heavy coats, with the odd instance of a starlet visibly shivering in the cold while trying to show some flesh. 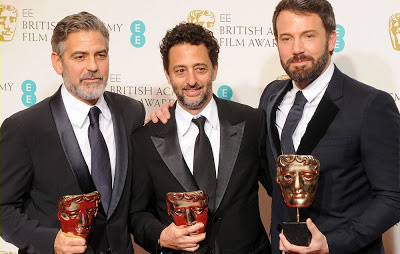 And as predicted, it was Argo's night in the spotlight, as Ben Affleck won two of his three nominations - for Director and Film (produced with George Clooney and Grant Heslov, above). He missed out on Actor to, unsurprisingly, Daniel Day-Lewis. Bafta voters also showed their love for Django Unchained, giving Original Screenplay to Quentin Tarantino and Supporting Actor to Christoph Waltz, essentially making this category a two-horse race at the Oscars in two weeks between Waltz and SAG winner Tommy Lee Jones. Anne Hathaway continued her romp through the Supporting Actress category this awards season. And in a not-so-surprising upset Emmanuelle Riva won Actress, considerably boosting her chances of taking the Oscar. The nicest surprise was David O Russell winning Adapted Screenplay and delivering a genuinely unexpected thank-you. In the British categories, Skyfall was the predicted winner of British Film; British-produced docs The Imposter and Searching for Sugar Man both won awards; despite the fact that no one saw Killer Joe, Juno Temple won the public vote for Rising Star; and the two awards for venerable Brits went to filmmaker Alan Parker (Bafta Fellowship) and Film Four veteran Tessa Ross (Outstanding Contribution). Pictured at right (clockwise from top-left): Hathaway, Waltz, Temple, Tarantino, Mendes and Broccoli, and Day-Lewis. Speaking of venerable, Stephen Fry was simply terrific as the ceremony's host, with his smart, hilarious banter, most of which probably went over the heads of the Americans in the audience, for a variety of reasons. Mixing absurd silliness with pithy commentary on recent headlines, he kept things moving impeccably as always, eliciting a kiss-to-camera this year from Jennifer Lawrence and flirting shamelessly with a slightly perplexed Jeremy Irvine. The Best Presenter-Pairing Award goes to Bradley Cooper and Affleck - there were audible "woofs" from the audience as they strode manfully tot he podium. The Best Acceptance Speech Award goes to Waltz, for a warm, snappy thank you, with Day-Lewis as a witty runner-up. Meanwhile, films screened for London critics this past week included the gonzo guilty pleasure Hansel & Gretel: Witch Hunters, a violent fairy tale starring Jeremy Renner and Gemma Arterton (who both presented awards at the Baftas). Elijah Wood stars in the first-person remake of the grisly serial killer horror Maniac; Danny Dyer stars in the dire film adaptation of the British farce Run for Your Wife; Romain Duris stars in the charming, slightly too-quirky French romantic-comedy Populaire; and Japanese filmmaker Hirokazu Kore-eda won the week with his drop-dead gorgeous childhood adventure I Wish. 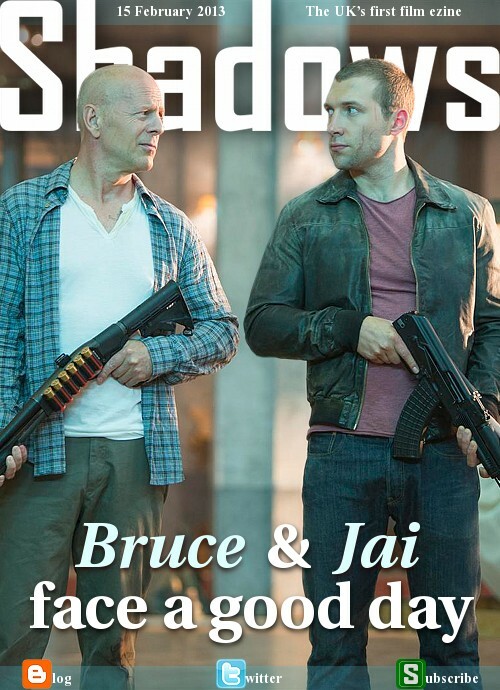 This coming week's titles include late screenings of Bruce Willis in A Good Day to Die Hard and Alice Englert in the teen-franchise launcher Beautiful Creatures. We also have James McAvoy in a film of Irvine Welsh's Filth, Viggo Mortensen in Everybody Has a Plan, Brady Corbet in Simon Killer, Joss Whedon's take on Shakespeare's Much Ado About Nothing, Mathieu Kassovitz's thriller Rebellion, the New York gang drama Gimme the Loot, the Oscar-nominated Israeli doc The Gatekeepers, and the Snoop Dogg/Snoop Lion doc Reincarnated.